The Electro-Harmonix Bass Micro Synthesizer creates tones ranging from the classic vintage sounds of the early Moog synthesizer to wild custom creations, and everything in between. Ten slider controls lets you dial in a virtually limitless array of analog synth sounds. Its four voices - Guitar, Octave, Sub-Octave, and Square Wave - are completely independent and fully mixable. The Bass Micro Synthesizer can modify these signals with envelope control for a variety of "bowed" or "blown" sounds. 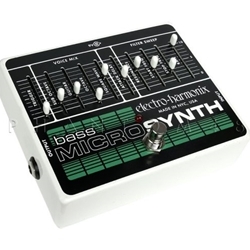 If you want to take your bass sound further than you've ever taken it before, the Bass Micro Synthesizer will get you there!